When we reported that iPhone OS 3.1 breaks MMS and Tethering hack, we had many readers reporting that MMS and in some cases even tethering is working for them after upgrading to iPhone OS 3.1. It looks like it is working for users who had used the MMS hack. Aaron Krill who had discovered the MMS hack for iPhone OS 3.0 is at it again. 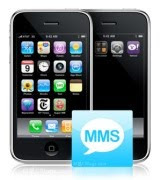 He has figured out a way to enable MMS on iPhone OS 3.1 without the need to jailbreak your iPhone. Please proceed with caution and remember that you run the risk of voiding your iPhone's warranty. Modified version of ATT_US.ipcc (carrier file), which can be downloaded from this link. Note: This will work only for AT&T customers. 2. Open Terminal (Applications > Utilities > Terminal). 2. Go to Start then Run and type CMD. Note: If the command in point 3 doesn't work then please double check the path of iTunes.exe on your computer and use that path instead of the one mentioned withing quotes above. Open iTunes & connect your iPhone. Click on your iPhone in iTunes(under devices listing). Windows Users: hold shift and click “Check for Update”. MAC OS X: hold alt and click “Check for Update”. Select the .IPCC you downloaded earlier. MMS should be enabled on your iPhone. Based on feedback from our readers and this HowardForums thread it looks like updating your iPhone with the carrier file is working for quite a few users. However, it doesn’t seem to work for everyone. Aaron thinks that this is because AT&T is in the process of removing the opt-out codes. I think AT&T is probably rolling out the MMS feature gradually for the official launch on September 25. It looks like the tutorial doesn't work for iPhone 2G users and the earlier method to enable MMS on iPhone 2G also doen't work with iPhone OS 3.1. After i typed this stuff in mine and restarted my iphone it worked. Updated the post to add a note based on James's suggestion. Thanks James.